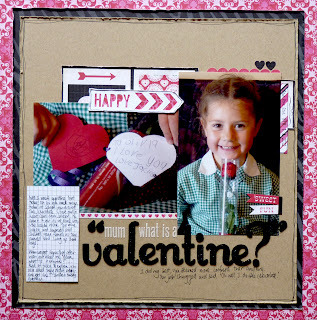 You would think having three daughters I would use a huge amount of pink supplies but I actually use very few, so when Adrienne sent me some of Lori Whitlock's Love Story collection I was really happy to try something different. My first thought went to the photos I used on this page, these are probably the only true Valentine's Day photos I had to scrap. I had pulled them out several times before and I had real trouble getting anything to go with them. Everything seems to clash with the school uniform. I really wanted to record the memory though because I thought it was hilarious and a little strange that my five year old received a Valentine, and that I had to go home and explain to her what it was! So my old standby for difficult coloured photos is kraft, then I added a small frame of the wild about you paper and a larger frame in the b-side of this leopard paper. I am a big fan of any papers filled with elements you can cut up and this collection has a few great papers for that. I used this one called snapshots, for the little polaroids behind and the little row of hearts and also the little sweet fun flags. The title is a combination of Lilybee alpha stickers, I love these things and some glittery thickers. If you can't use glitter on a Valentine's page then when can you use it. 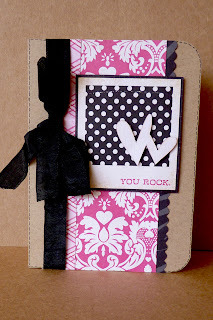 The little happy arrow I cut on my Silhouette and then backed it with some scraps from the collection. With some of the other papers I made a card and also a little treat bag for my girls for Valentines Day. I loved this 'you rock.' polaroid and I knew it would make a great card. 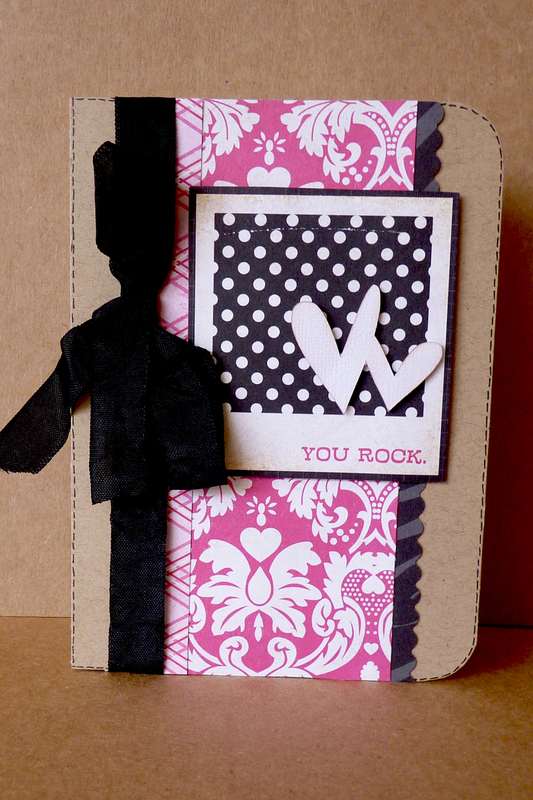 I cut this treat bag on my Silhouette also, it is one of Lori Whitlock designs and I think it turned out really cute. I really like how these bags look with the double sided paper. 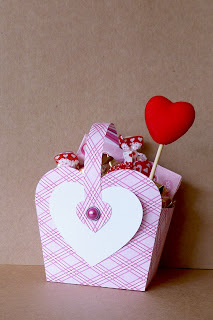 Thanks for stopping by the blog today, I hope you have a Happy Valentines Day.